for specifics on indoor lights, plant selection, and transplanting. It is fun to grow your own plants from seed to harvest. Starting plants from seed is cheaper than buying seedlings at the store. There also are many more seed varieties to choose from than you can typically buy in a store. You can grow higher-quality plants, fit your own planting schedule, and take pride in your growing skills! There are a few start-up expenses that will make your first year as an indoor grower more expensive, but you should make up the cost by the end of the year as your harvest comes in. run a load a few times to warm the flats. A space heater is also a big help. Some kids' garden clubs just have one seed-starting location, and others ask several families with kids in the club to grow a "flat" (tray containing, typically, 36 seedlings) or two, in order to spread out the responsibilities. § Set aside a table or counter space in your home that you can dedicate to seed-starting in the late winter and early spring for two months or so. Depending on how much space you have, decide how many seeds you are going to start, and in what containers. § Select plants that can be started from seed indoors weeks before the last freeze in your area. Use the backs of seed packets and other resources. § Order those seeds from catalogs or purchase them in a local store. § Determine the date of the last expected freeze in your area. Call your local county extension office if you are not sure. Then schedule Planting Day. § Make a sowing and transplant calendar so that the seedlings are the right size when it is time to transplant them. Some seeds should be started eight weeks ahead of Planting Day; others just four weeks ahead, and a few just two weeks ahead. § Decide whether you have good enough light from a large window, facing south, that lets natural light in very well, or (as most people find) you have to set up an indoor light system, probably on a table. You can set it up next to a window for the best of both worlds, or in your basement out of the way. § Set up a lighting system. A typical solution is shoplights with fixtures that have two 4-foot tubes, arranged on adjustable chains hanging from an overhead pipe or hooks in the ceiling, or some other support that is above the table surface, with a timer to give the plants 12-14 hours of light per day. You may need more than one shoplight, if you want to start a lot of seeds. Compare the length and width of your seed-starting containers to the length and width of your light source, to determine your needs. § Make a sowing and transplant calendar so that the seedlings are the right size when it is time to transplant them. A few plants, such as celery and leeks, need to be started from seed 12 weeks before being transplanted outside. Some seeds should be started eight weeks ahead of Planting Day; others just four weeks ahead, and a few just two weeks ahead. § Punch drainage holes in the bottom of any container, such as yogurt cups, cottage cheese containers, cut-off plastic soda bottles, tall milk cartons, foam cups or plastic pots, with an ice pix or a hammer and nail. Wood, plastic and clay pots are fine, but make sure there are drainage holes. You can also buy self-watering seed-starting kits that water from the bottom, and those are a good convenience. When made of Styrofoam, they are insulated and therefore afford excellent protection against wide temperature swings. § Sterilize planting containers, and the trays that go under them to catch excess water later, with a solution that is nine parts water, one part bleach. This is to prevent infection from bacteria and fungus that can kill all your seedlings before they even get going. It's called "damping off." You don't want it! Rinse well under running water and let air dry. § Buy soilless growing mix - NOT regular garden soil or even potting soil. You need specially-prepared seed-starting mix available in garden stores. This is also a defense against damping off, because this soilless mix is sterile. A good seed-starting mix has spaghnum moss (dehydrated bog plant that can soak up more water than a sponge), perlite (made from lava rock and is a good soil aerator and water retainer) and vermiculite (little bits of mica rock that retain water and also soak up fertilizer for later release to the roots as it dries) to enable root growth. § To save money, you can mix your own seed-starting soil with 40% milled sphagnum peat moss, 50% vermiculite and 10% perlite. You can use garden soil or compost, but is essential that you pasteurize it - kill bacteria and fungus. Place the mixture on a cookie sheet and place in a preheated, 180-degree oven. Leave it in at that temperature for 30 minutes. This will eliminate any disease organisms present. One note though: it might smell bad for a while. § In a plastic bag, add warm distilled or dechlorinated water to your soilless growing mix until it is moist but not muddy. Use your hand or a spoon, and keep the bag mostly closed as you stir, to prevent the dust from getting out. The sodium in softened water could kill your seedlings, and chlorine could, too. To dechlorinate water, simply turn on your tap for a minute and let most of the chlorine run down the drain, then fill your spray mister or watering can and let it sit overnight. § It's a good idea to wash your hands with warm water and soap before and after this process. Many seeds are coated with a fungicide; your seed packet should tell you. You wouldn't want to be on your hands for long. You also might want to wear rubber gloves, especially if you have any cuts or scratches on your hands or wrists that germs from the dirt might enter into. § Place water-catching trays on your table or counter. Place your containers on the trays. Place the moist soilless growing mix into the containers. Fill them to within ½ inch of the top on the sides, mounded even with the top in the center. This promotes good air circulation, discouraging disease. Push down gently with the end of a ruler to "tamp" in. § Have your plant labels and waterproof pen ready to go. It is important to label each row or container because many seedlings look alike and you may switch them around later on. Label them as soon as the seeds are in. § Your club should have a Garden Notebook and now is the time to record the type of plant, the variety (or name of the particular plant), how many seeds, and the date. You can come back later and record how many seeds germinated, and later, how many plants you transplanted outside and what date. Then you can easily figure out when your harvest is going to be! § A few days before, check your seed packets to see if any seeds need to be refrigerated, soaked in water, or nicked with a sharp knife, to hasten germination. Sometimes, these steps should be taken a few or several days in advance, so be aware. § If you are growing seeds in a "flat" - a shallow plastic, wood or even cardboard tray, pot or box with just one big opening -- use the ruler to "draw" a long, shallow rut - a "furrow" -- down the "flat" in two or three lines. It should only be one-fourth inch to one-half inch deep. Then lay the ruler on its side along the furrow so you can see the inch marks. § Tweezers are a good solution for handling small seeds. § Sow small seeds such as petunias, snapdragons and flowering tobacco at five to eight seeds per inch if you're planning to transplant them into larger individual containers once they have gotten started. Typically, you would do this for tomatoes and peppers, for example. Many smaller plants, such as lettuce, are fine in the same container because they don't get too big before transplant time. § Sow larger seeds, such as melons, at three to four seeds per inch. Note that squash and melons have sensitive roots, so start them in their own containers, not flats, and keep them there until they are transplanted just once, straight into the garden. § Sow fewer seeds, perhaps three or four per inch, if you intend to keep the seedlings in that same container until planting time. You can come back in and snip off unwanted seedlings later, if they all come up. This is called "thinning." § Sow seeds in the same flat if they all need light to germinate. Read the seed packets to determine these. Usually, this is true for seeds that are very tiny (i.e. petunias, lobelia, coleus and ageratum). § For other seeds, lightly sprinkle soilless mix on top of the seeds to cover, just barely. Try to cover with no more than three times the diameter of the seed. Remember to label each row or individual container! § If you are growing seeds in individual "cells" or containers (peat pots, yogurt cups, toilet-paper tubes, etc.) - poke shallow holes (one-fourth inch to one-half inch) in the soilless mix with a pencil, put two to four seeds in each container, cover lightly with more soilless mix, and later, thin all but the strongest one. § Always save your seed packets for future reference. A plastic pocket for your Garden Notebook is a good idea to store them. § Cover with the clear plastic cover if provided in a seed-starting set, or with clear plastic wrap, or glass, until you can see green seedlings. You can poke plastic forks in, here and there, to hold the plastic up a little. If the seed packet doesn't say the seeds need light to germinate, put them in a dark, warm place. Check daily! When you see the sprouts, remove the plastic or glass. Some plant-starting "systems" have a plastic greenhouse top that you can leave on, to keep humidity high. § If mold begins to grow on your soilless mix, it is too wet. Scrape away and discard the mold, and take the plastic off for a day to let air get to the soil. Then replace the plastic. 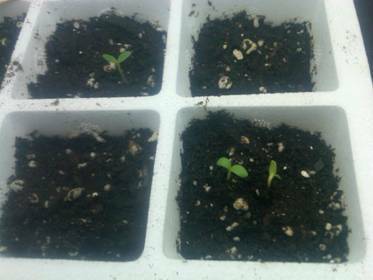 § Put your containers someplace warm during the germination phase. Warmth speeds up germination. The key is warm enough soil, not necessarily warm enough air. 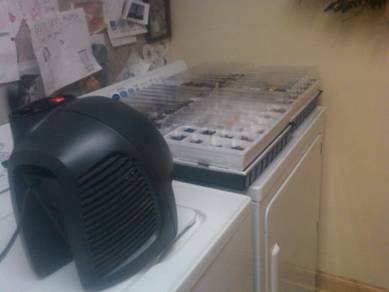 Good options: on top of your dryer, on top of the refrigerator, on top of a big TV, or near your furnace. Temps of around 78 degrees are best for most plants, but check the back of your seed packets; a few need 85 degrees! You can buy a heat mat if necessary to keep the soilless mix at a warm enough temperature for these seed types. A space heater is also a good bet. § Don't water or mist until the seeds germinate. You don't want them to rot in soil that is too wet. That's as bad as soil that's too cold. You should see water droplets on the inside of the plastic wrap. Soil that is too damp causes "damping off" - all of your baby plants suddenly die. § Ironically, most seedlings like cooler soil as they grow. So try to keep the temperature at 60 to 65 degrees, with 75 degrees as the maximum, where your seedlings are growing. A few seeds, such as beans, prefer hotter soil, so check your seed packet or gardening book. § Remember to check daily! If plants grow too long after germination without proper light, it can literally handicap them and they'll never grow properly. We have germination! Bachelor's buttons sprouted in just 3 days. § When you can see green baby plants, it's time to remove the plastic or glass and move your containers to that sunny window, if you have it, or under your light source. If your seedlings are next to a window and it's cold at night, place a blanket between the plants and the glass, or move them away from the window at night. § Even the sunniest of windows can't usually give seedlings quite enough light. Seedlings tend to be leggy and weak. If you can't rig up indoor electric lights, you can still beef up the amount of available light coming through the window. Simply cover cardboard with foil and prop it behind your plants, so that the light coming in through the window is reflected back onto the plants and not into the room. § Use a timer, or be vigilant, to keep the lights on long enough and give your plants 14 to 16 hours of light a day. They do need rest each day, but if you don't give them enough time under the lights, they will be straggly and weak. § If you are growing under a light source, keep the bulbs no more than two or three inches above the seedlings as they grow upward. Use the adjustable chains to gradually move the light source up as the seedlings grow taller. It's just another reason to check your plants daily - you wouldn't want them damaged by touching the light source! § The first two leaves you will see are "cotyledons" (kot tle EE dons, food sources for the plant embryo, the symbol of the transition from seed to plant). When plants have put out their first true set of leaves, which will appear after the cotyledons, and are an inch or two tall, you can transfer them carefully to individual containers (usually 2" x 2") if you would like to, but don't handle them by their tender stems! You can use a spoon to dig them up with a "rootball" so that you never touch the plant parts at all while transplanting. § At this point, if you are going to leave the seedlings in the shallow flats, and too many seeds have come up, you need to thin them by snipping away excess plants a the soil line. Snip away any plants that are shaped funny or look weak. § Once your seedlings have appeared, stop misting, and water with a watering can, preferably one with a long, narrow spout. Try not to get water on the leaves; just water onto the soil around each seedling. Remember, just keep the mix moist, not wet. § It's probably a good idea to transplant all plants from flats to individual containers (sterilized yogurt cups? store-bought plastic flats with multiple cells? square 3" or 4" pots?) after three or four weeks. The more room for the roots, the better. It's very hard to separate their roots and shoots if you leave them crowded together for too long. It's also hard to separate them if their soilless mix is too moist. § Transplant tomatoes and peppers to a larger, 4" individual container when the seedlings are three times as tall as the container they are in now. Use your fingers or two spoons or forks to scoop up the rootball, or a small spoon. Try your best not to touch the plant itself, especially being careful not to bruise or break the stem. Always transplant tomatoes deeper than they were growing before, and remove any leaves on the stem that's now going under the soil. This is to encourage new root growth along the now-buried stem. § If you're using a shallow flat that's two inches deep, transplant before the tomato and pepper seedlings are six inches tall. You do this so you don't stunt their growth. The larger the growing space available to roots, the larger the seedlings will become. There is a special transplant mix for this purpose, or you can use finely-sifted compost. By the time seedlings are six weeks old or so, they can fight off any bacteria or fungus that they would have succumbed to in the early going. § Later, you may want to transplant your tomatoes one more time, to gallon pots, if you have enough light to keep them going. § For all new seedlings: after the true leaves are up, let the soil dry out slightly between watering. Water early in the morning so the leaves can dry off and avoid diseases. Water with lukewarm water in a spray-bottle or mister until your seedlings are sturdy. Then you can switch to a watering can with a rose nozzle - a many-holed sprinkler head. Water enough so that a little water runs out the drainage holes in the bottom of the container. But the container should never sit in water. Your roots need air to grow well, and soggy soil keeps air from the roots. § Judge whether your soil is too dry by picking up the tray. If it feels too light, water slightly. You can also poke your finger in about an inch down, without disturbing the roots, and bring up a little soil to examine for how moist it is. § To make sure the water is getting to the soilless mix at the bottom of each container, you can occasionally set the containers in the waterproof tray and let them soak up water from the bottom. Drain well - do not let them stay in standing water for long. This way, roots will stretch and grow toward the bottom of the pot and you'll get what you want - a nice, fat rootball supporting a healthy, sturdy seedling. § Don't fertilize 'til the plant's true leaves have appeared. Then fertilize once a week at one quarter strength, or half-strength. That is highly diluted in water. Full strength might burn or kill your baby plants. Note that most commercial seed-starting mixes have fertilizer in them, so you don't want to overdo in the early going. If you notice a crystalline crust on your soil, you're over-fertilizing. Many gardeners swear by fish emulsion, or fish-and-seawood liquid fertilizer. If your plants seem to be growing too fast, switch to fertilizing every other week. Don't fertilizer the last week before setting plants outside so they will have reserved strength for the transplantation process. § Insufficient light isn't the only reason a seedling started indoors might be weak, spindly and unable to support itself. It hasn't had the natural pressure of wind and rain to make itself strong. So once your seedlings are up and growing, set up a small oscillating fan near the seedlings so that they "learn" to sway in the breeze and stand up straight. Run the fan just a couple of hours a day, and your seedlings will be stronger. § If your house's humidity level is too high - over 50% -- and if you don't have a fan on your seedlings, you are asking for trouble in the form of soil fungus and plant disease. You might put a layer of clean gravel or small stones in the waterproof tray under your containers to drain moisture farther away from your plant containers. And don't forget that fan for air circulation! § If mold starts to grow on your soil, your soil is too wet. Scrape off and discard the mold and don't water for a few days. Your seedlings won't be hurt. § Get your seedlings ready to be transplanted outside by gradually exposing them to the outdoors a week before. This is called "hardening off." Leave them outside on a covered porch or under a shade tree for an hour a day, gradually adding a hour's exposure per day. Make sure they can't be damaged by wind and hot sun. § Transplant on an overcast or drizzly day with calm winds. If it's raining, don't water the first day, but do water the next day. Don't panic if a few plants, including cabbage, look like they've died after transplanting; be patient, and they'll spring back to life.